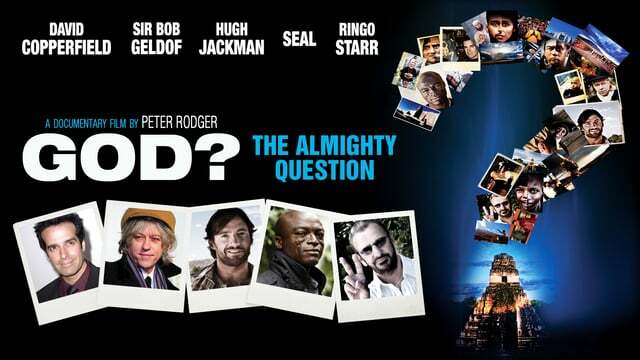 Its a simple question that acts as the spine of Peter Rogers documentary film. "What is God?" That simple question taken to people from all walks of life and all corners of the globe makes for an interesting examination of what God means to the individual instead of what we are told God is from institutions. The opening of the film feels somewhat like Koyaanisqatsi (without the Philip Glass score) in that we are shown how man is out of synch with nature. Rogers is substituting nature for God in this instance and thereby setting up a personal statement or point of view before examining the thoughts of his interviewees. This film will elicit unique responses from every viewer. The parts that I found amusing could be gospel to another and the moments that I found touching could evoke anger. That's the beauty of this film, its difficult to watch without examining your own personal belief system, whatever it may be. The interviews include a handful of celebrities but the participants are mainly everyday people talking about their beliefs. Most of us are given our beliefs from our parents and rarely do we discuss them with people who have differing opinions. We are raised to believe that spiritual examination is a private journey and I'm happy to see this very public discussion. If you can go into this film with an open heart you could find it to be a moving analysis of what it means to; be human, search for essence and find community. To my atheist and agnostic friends this is no way an anti-science pro religion rally designed to dispute global warming. No, this is a film about how there is something deep within humanity that searches beyond itself for answers. I'm in no way religious but I am curious about what it means to be anthropomorphic. What are the characteristics that define us, the thoughts and principles that shape who we are and how we see the world around us? These are questions that need to be examined by people with differing views than our own so we can better understand who we are. Sometimes it's the the simplest questions that can garner the most potent responses. You can find God? The Almighty Question on Amazon or on iTunes.